Finally the new IMG (Interactive Media Guide) was activated in my area. After a couple weeks of getting used to it, I’m ready to share my experience.As promised the new IMG has more pleasing graphics. It looks new, whereas the previous guide looked outdated. Looks aren’t that important, lets get to the good stuff. Even though the new software update is referred to as the interactive media guide, its actually much more than the guide. It is basically the operating system of the Verizon Fios set top boxes. The features vary from box to box, but the format is the same. 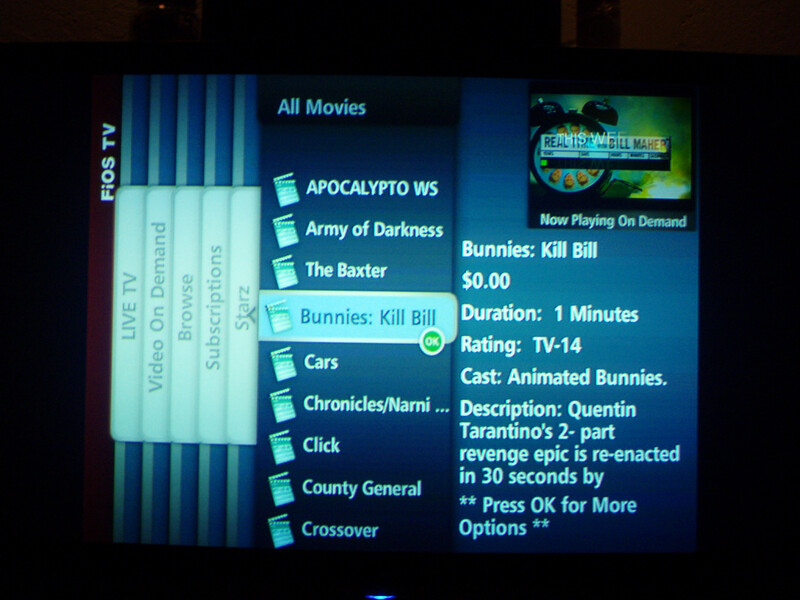 My review is based on the DVR box, the Motorola QIP 6416. My favorite improvement became immediately apparent: the previously laggy skip ahead and back feature is now instantaneous. Skipping commercials is much easier now. The skip ahead/back feature can now be programmed to the desired amount of time (10 secs, 30 secs, 1 min, 5 mins). Also immediately apparent was the information popup, which appears when info is clicked, or a recording is ff, rr, or paused. The popup shows more useful information, such as the show title, description, start and end time, remaining recording time, etc. The playback location (if the show is recorded) is shown visually with different colors. More detailed information is shown incrementally by pressing info up to 3 times. Navigating the new user menu will take a little getting used to. Some people may not even like it. I must say it is an efficient design, but just not what people are accustomed to. When navigating through the guide or menu settings with the arrows, the selected item is always in the middle of the screen. It is shown highlighted, and sometimes, in the case of the guide, the selected item is zoomed in to show more information. This is unnatural because pressing the up/down arrow does not move the cursor/selected item. Instead the list is moved up/down showing the next item in the highlighted center. When navigating multiple levels deep, the trail of menus is always shown on the left side of the screen. Each menu deeper will add another layer, and move the cursor to the right. This navigational method IS intuitive and efficient for a menu that is controlled with directional arrows. It allows more complexity without getting lost. The only problem is the learning curve, but then again I suppose that is a problem with most navigational menus. 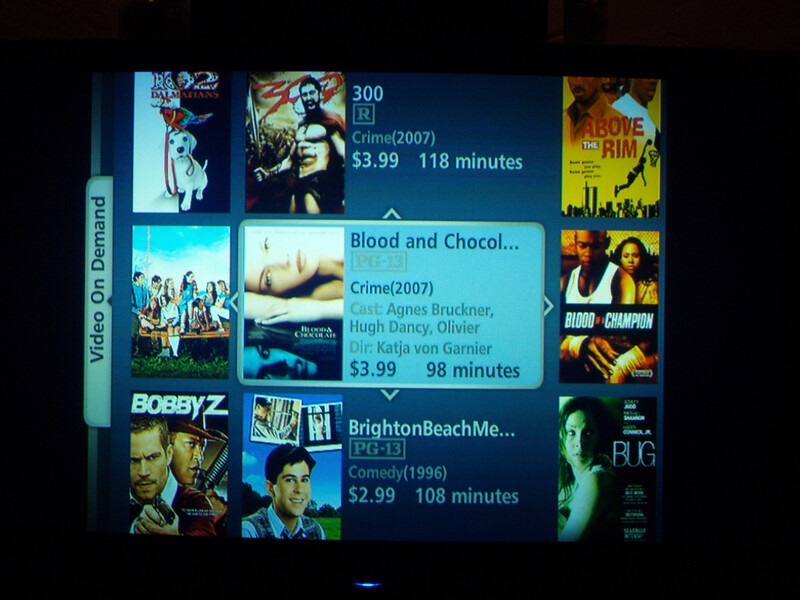 Another improvement is apparent in the Video on Demand navigation. After navigating through many levels deep to select a video and play it, the navigated position is remembered. This was not the case previously. The new menu is much more visually appealing. The colors are good, the graphics are smooth and transparent in many cases. The channel logos are always shown, making navigation more familiar. The video on demand menu for featured Pay-Per-View movies now shows a movie poster/cover, which surprisingly makes a big difference when it comes to browsing through movie titles. The on screen guide also has a halfscreen option in addition to the standard fullscreen guide pictured above. The font is nice and easy to read, but some of the younger users may prefer smaller font so that more information can fit on the screen. Previous to receiving the new guide, I had heard of many bugs and issues with the new IMG, which probably delayed its nationwide release. However, I have not run into many issues with the new guide. I actually had more issues with the Dish 942 software. The only issue that has made an impact is the recording capacity bug. Apparently Verizon is aware of the issue and fix is in the works. The problem is the way that capacity is calculated and made available. The 180 GB hard drive should record 25 hours of HD, but due to a bug, the system only allows for 15 hours of HD. SD is 10x the capacity, but rarely do I record SD anymore. In addition to fixing this issue I hope they also add the capability to connect and external hard drive to increase the capacity. As with all new menu systems, it takes a little getting used to. Overall I think it is a huge improvement and I’ll look forward to future upgrades. Check with Verizon for availability: Can you get Fios TV? To ask questions and share information regarding Fios, please check out the Fios Forum. November 16, 2007 Post by Duane in Fios. 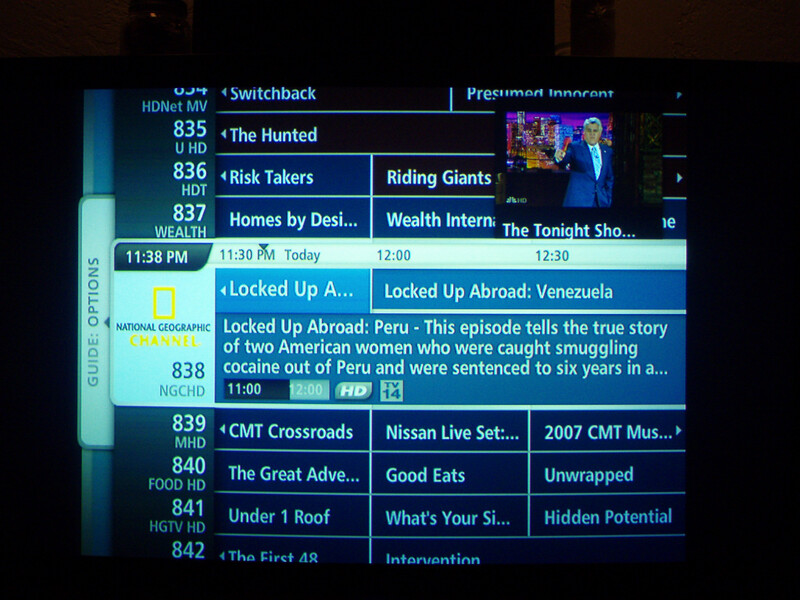 The local channels (not 800’s, those are HDTV) are available without a set top box. nice review. Tripleplay will be installed 2/5/08 and based on what I see the TV side will be a decent upgrade over Time Warner digital cable and their guide/dvr menus (which have not been upgraded since I have had them for several years). Internet will be the same, I currently get 15/2 with road runner (via time warner) so no change with Fios. And the phone will be an upgrade. I opted to save $10 with TW by only having CA calls be free and all other states I get charged. Verizon/Fios does not have a non-nationwide plan, so now my distant relatives (MT and WA) will be hearing more from my family. I am “satisfied” with TW at this time, so hopefully I am not shooting myself in the foot with switching, b/c Verizon required a 2 year commitement! But I have 30 days after install to change my mind, if I don’t like what I see. Your review is very informative and helpful. I’ve only had my HD set for a few weeks. I used an HDMI cable to connect the Blu-ray disc player and expected to do the same for the Fios set top box. I was surprized to notice that the boxes in your review don’t seem to have that connection. Before I make the switch from Comcast to Fios, I wanted to see if you had any thoughts on whether it is or will be available with HDMI interconnection. I have always hated set top boxes and run my basic cable right to the TV. This will be a departure for me if I elect to do it. After months of hype, we finally received the new guide. Unfortunately, I would be hard pressed to call this an improvement. The worst features: By blowing up the item in the middle of the menu and inserting program description information, etc. It makes it very difficult to visually scan the menu page top-to-bottom. If you have a standard stb, the search is insane. They have reproduced a phone keypad with 3 letters and a digit on each button. You are basically text messaging. On the HD box, they have all 26 letters, no idea why this would need to be different on the standard box. Also, it appears you can no longer remove channels from the standard guide, only the favorites, so when you bring up the standard guide all those channels I don’t subscribe to or would never want to watch are always there. 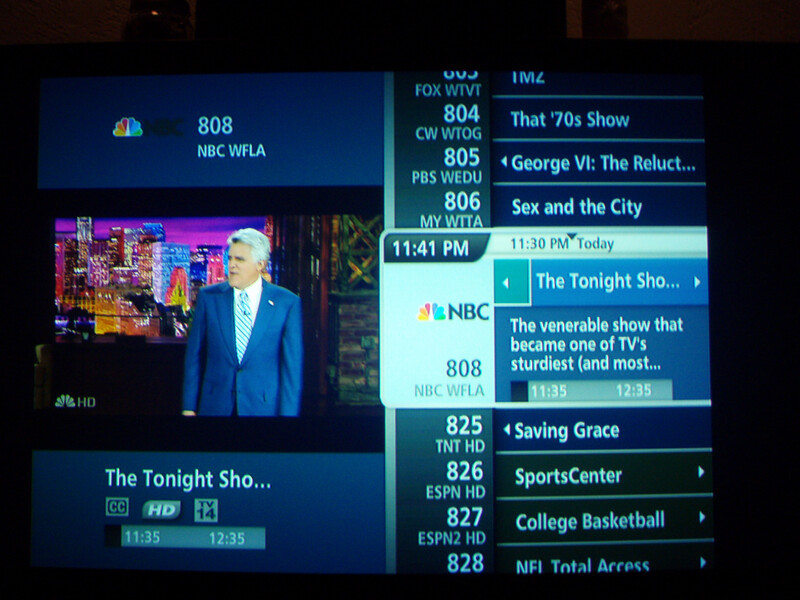 On the positive: searching dvr, guide and on demand thru one search. Can now use the channel up/down to page up/down in the menu – though the new design makes visually procesing the menu a page at a time difficult. Wish list: ability to have scouts like the directv had where you can enter searches that automatically run and notify you when something matches comes along in the future. Set reminder on hd for future programming. I must say that I am surprised by your review. I have had FIOS TV for 1 yesr now and preferred the previous menu guide. The responsiveness to the remote is horrible. I end up waiting approximately 2 seconds after each key tap before the set top box responds. I am currently using the Motorola QIP 2500 series set-top Terminal. While I do agree with you that the colors are more pleasing to the eye and I do like the new search functionality, I would gladly give it up to have the old menus back for performance sake. Using three STB’s in one cabinet is a pain (One for each of two VCR’s, and one for the TV). Found the solution to isolating the IR signals by purchase of IR Remote Extenders that work on 418MHz and 433Mhz for controlling two of the STB’s and use the normal IR Remote signal for the other STB. Had to fabricate covers to mask the IR receiver in two of the STB’s. Advantage of the Remote Extenders is that the RF signal passes thru floors and walls so the STB can be in another room if you so desire. Wife can take the remote to the basement and control the STB located in the Living Room upstairs to switch channels for the basement TV (split off the LR TV cable). Same concept could be used for wall-mounted bedroom TV by locating the STB in a closet or another room. The RF/IR extenders by Next Generation are available from summitsource.com as item numbers RMT418 (418MHz) and RMTSB7 (433MHz). The transmitters have a rechargable battery and fit inside your current Remote Control. Note: They do not work with Harmony Remotes and possibly others. Mine are working great in the Philips Remotes that Version supplied with my QIP2500 STB’s. Cancelled my MDM cable service within 24 hours of the Fios TV being added to my Verizon Internet and POTS. Only complaint is Volume of the local inserted commercials. In the new IMG, can search results be displayed to show what is on NOW rather than by show title? Rich, the Fios HD set top boxes definitely have both HDMI and componenet video connections. JKeefe, I’m not sure why your guide is slow. Mine responds very timely. I was told buy the Verizon Saleman that you can download movies from your PC and play them with the new media guide. I know Verizon states on their website that you can download music and pics from your computer. Can you download movies to your computer from Netfix and play them in your meida guide? This would be a cheaper option then buying movies On-Demand. We don’t get all that Fios has (which is fine), how do I remove those channels from my tv so I don’t have to keep flipping through empty channels? I tried to do this from my tv remote, but that doesn’t seem to work. Also my tv is not set for channels over 99. DEF EFX was created in the name of technology. We like to engage in discussions on our favorite technology-related topics. We like to provide useful information that leads to the adoption of new and cutting-edge technologies. Hopefully one of our articles will help you on your technological endeavors. We encourage users to share their knowledge and experiences through comments.